Psychologists study mental processes and behavior. 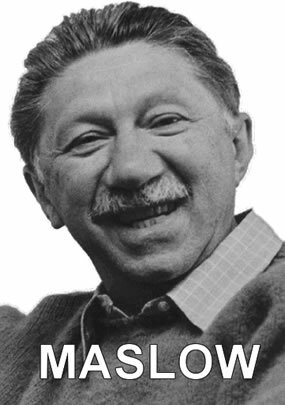 Most early psychologists studied people who had problems, but Abraham Maslow (born 1908 – died 1970) studied people who were satisfied with their lives. Maslow decided that people want to be happy and loving, but often there are particular unmet needs that keep them from being satisfied. Maslow believed most people want more than they have. Once a person meets their most basic needs, they develop higher needs. Maslow said, “As one desire is satisfied, another pops up in its place." Biological necessities such as food, water, and oxygen. These needs are the strongest because a person would die if they were not satisfied. People feel unsafe during emergencies, or times of disorder like rioting. Children more commonly do not have their safety needs met when they feel afraid. These would include the need to escape loneliness and alienation, to give and receive love, and a have sense of being a part of a group. Love and belonging needs are usually met within a family. These needs are fulfilled by a sense of value, having self-respect, and to be highly regarded by others. If a person does not fulfill their esteem needs, he or she feels inferior, weak, helpless, and worthless. Maslow taught that a very small group of people reaches a level called self-actualization, where all of their needs are met. Maslow described this state as a person finding their “calling." He said, “a musician must make music, an artist must paint, and a poet must write." Many people confuse self-actualization with fame or fortune, but often this is not the case. While wealthy or celebrated people might reach self-actualization, many people who have reached the highest level of happiness are unknown beyond their circle of family and friends. According to Maslow’s theory, civilization developed because people wanted more and sought to improve their circumstances. Once people met their physiological needs and felt safe, they began to develop a culture and an advanced civilization.